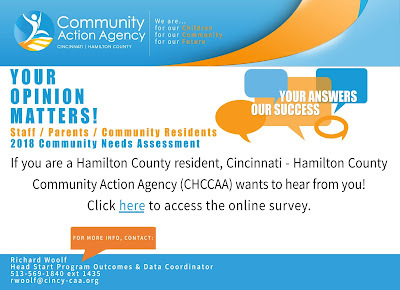 If you are a Hamilton County resident, Cincinnati - Hamilton County Community Action Agency (CHCCAA) wants to hear from you! Please take 20 minutes to help your community by completing our short survey. Access the survey online by Clicking here. Based on what is learned from this survey CHCCAA will be in a better position to understand some of the strengths of the community, as well as some of the issues facing people who live there. Your input will help us improve the services we provide for the residents of Hamilton County. Your responses are not individually tracked and are kept confidential.